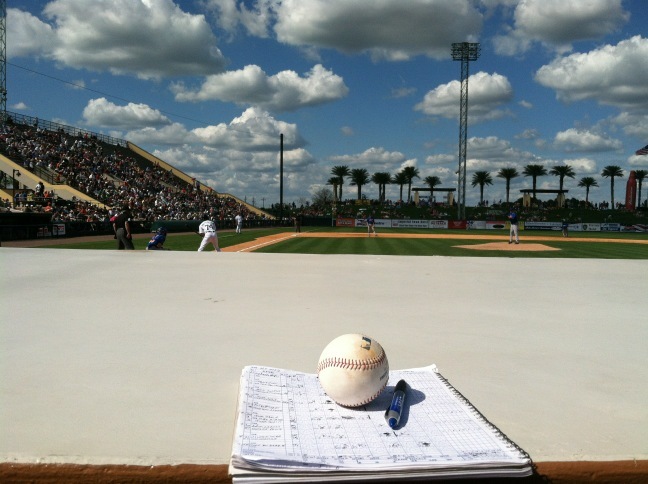 Scorebook and ball at a Spring Training game in 2012. Greetings from St. Petersburg, Florida! As (my last) spring break draws to a close, my shoulders, forearms and cheeks are red, and the pages of my scorebook are filling up rapidly. That’s because, for likely the last time for a while, I’m touring the Grapefruit League in Florida. I’ve been taking in spring training games featuring the likes of the Red Sox, Baltimore Orioles, Toronto Blue Jays and Atlanta Braves (to name a few). I’ll be returning to Boston late tomorrow night with my sights set firmly on commencement and (sigh), the real world that awaits myself and my fellow seniors following that ceremony. But, I’m not worrying about that right now. Instead, I’m focusing on taking in my last Grapefruit League game. I just settled in at my hotel in St. Pete, a place which is special to me for an entirelydifferent reason. The trip included a visit to Boston’s new spring training complex in Ft. Myers. After a game at jetBlue Park and a few hours watching major league drills on the practice fields, it has my stamp of approval. I’ve been fortunate enough to have my Dad with me in the Florida sun each of the last five springs. This year is different in a lot of ways, though. This week has been his first as a retired man, with little to worry about other than helping me keep up with a flurry of defensive replacements and pitching changes. At the same time, I’ve got a mountain of projects and tasks that await me when I return to Boston, not the least of which is preparing to go to work after graduation. With the job the I hope to get after graduation, I likely won’t have a free week in the middle of spring to trek down to Florida for exhibition baseball. Last May in St. Pete, I made nearly a dozen lifelong friends who all share a passion for journalism and are at similar junctures in life. Even though I’ve been coming to this area for a half-decade now, it’s somewhat strange being in St. Pete without any of them. But, it serves as a reminder just the same of how lucky I am to have friends that I can relate to at this point in life, and talk to about ways to best set myself up for success. Seniors, do you have any spring break traditions that you’ll be bidding farewell to this May? Do you have any peers in your field that you can turn to for advice as you prepare to graduate? Underclassmen, what did you do for break? I’ll be back soon with a commencement primer. For now, I’m focused on the Tampa Bay Rays and the Blue Jays tomorrow in Dunedin, FL. Next Next post: The 1851 Chronicle has gone live! First of all, I am extremely jealous that you got to see the Red Sox new stadium! I was fortunate enough to see the practice facilities last year. It’s amazing how nice they keep the practice fields, they treat it like Fenway. Anyway, I am impressed with this blog. It looks and reads impressively. You have a nack for writing and I read a few posts, just so happens this one stuck out to me. Good job!